We left Rotterdam and arrived to Switzerland Thursday morning. After a short sightseeing in Zurich we had meet up with Joel, the third participant coming from our school, with who we prepared together, but now he was a competitor of ours. He picked us up with his car, and as a local, he showed us around the region. We had an amazing day and we arrived fully recharged to St. Gallen at the evening. After checking in to our hostel we attended the opening of Business Game, the Welcome Dinner. This was an amazing opportunity for networking, both to meet other students and company representatives. The competition was quite intense, between Friday morning and Saturday noon we solved four cases and afterwards we had a presentation every hour. Yet, for us this set up and the continuous “hurry-up” feeling gave something unique compared to other competitions and overall we enjoyed it the most. The first case was a CSR Challenge by Nespresso, where we had to come up with a new future “corporate shared value” strategy for the firm. The case started with a surprise, the other team with who we tackled the case was Joel and his teammate, so we had a perfect teamwork right for the first case. An addition to the traditional case solving process was that we also needed to create a short pitch video, which lead to some difficulties with our time management. Yet, the CSR Challenge was the most creative task during the whole Business Game and we certainly had the most fun tackling this case. The second case was the Marketing Challenge by Swarovsky, where the task was to come up with future product lines for the women’s accessories division. Our solution involved keeping and pushing the two most promising current product lines, leather bags and phone cases, and to introduce a new one, women’s lingerie. During these challenges luck plays a major part: as the other team is randomly selected, the overall performance of the team is influenced by how we can work together, how we complement each other and how we manage frictions among the personality and mindset of different team members. Fortunately, during this challenge we have seen what can happen if we found a good fitting team. Our new teammates, two Belgian girls showed us how is when the mindset of the other part of the team is complementary: they focused on the feelings and on the emotions, while we were continuously calculating, analyzing and looking for the best benchmarks. And the result was a killer presentation. Focusing on the emotions, but backing up everything with hard data we were not just convincing, but we felt that we were able to engage the jury during the whole presentation. Every presentation of the business game is followed with a two minute feedback session. After this, we felt that we not just delivered a strong solution, but we might be on the top. The third case was the Pitch Challenge by BDO, an intense case study with enormous amount of hard data. The firm, a Swiss furniture manufacturer faced numerous issues and their financial situation strongly restricted the possible solutions. Here, we made the most amateur mistake that is possible on a case competition and an advice, learn from our mistake and please, always double check the slides you submit. We did not, and we submitted an earlier version of our slides, where most of our solution was missing. First, we tried to manage this issue with the organizers, and we re-submitted our solution together with the organizers, but during the presentation we realized that those slides were still missing. However we saved what was possible during the pitch, but we had no chance to achieve a good result with this mistake. The final case was the Strategy Challenge by Zurich, an insurance company and our task was to redefine their customer segmentation with soft methods. As I have mentioned before, luck plays an essential part with who we have to tackle a case together and as everything favored us during the marketing challenge here the situation was more of an opposite: the mindset and the basic approach of our teammates was so different that we faced with a smaller team management crisis in the first hour. At the end we did not succeed to overcome this crisis and our solution was rather weak. The silver lining though is that we experienced to work with many different people and hopefully we learnt from this and in the future we will overcome these difficulties more smoothly. The presentations were followed the Eloquence Final, where the overall top performing four teams were invited and the winner was decided in an oxford debate. Because of our mistake during the pitch challenge and the weak results of the strategy challenge we did not expect to be among these four teams and we were already waiting for the prizing ceremony. 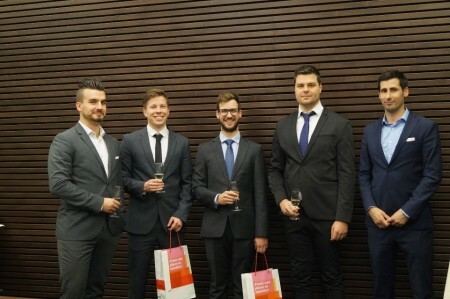 The biggest tension for us was during the announcement of the top three teams of the marketing challenge: and at last we heard our names and we were announced as the winners of the Marketing Challenge. Overall, we left Switzerland with many awesome memories, we faced new situations and we learnt a lot. The Business Game St. Gallen is something that we advise for every master student to join, for us it was unforgettable. We would also like to thank for CaseSolvers for all the help during our preparation, the trainings, all the advices and the valuable feedbacks that helped us to improve the most. Finally, good luck for all the applicants next year, you will experience something unforgettable!